Prudential Singapore’s Head of Government Relations, Magdalene Loh, shares how the company will work with the public sector to tackle issues related to the economy, healthcare and skills. 79% of finance professionals in Singapore feel they are not equipped with skills for their jobs in ten years’ time, according to a 2017 survey. That’s a huge number, but the response is not surprising as technologies like artificial intelligence, machine learning and automation are quickly changing the nature of jobs in the finance sector and inspiring workplace transformations. In the insurance sector, Prudential is one of those that is rapidly innovating to meet the needs of customers and to build a workplace fit for the future. Take its claims department for instance. Where previously large teams were working to process claims, Prudential Singapore is now trialing a machine learning solution that will help bring claims processing times down to minutes or even seconds, says Magdalene Loh, the company’s Head of Government Relations. Such technology frees more employees to spend time on meaningful customer initiatives rather than on manual work. The company is also helping its employees to broaden their skills and is improving mobility across roles, she adds. Attracting talent and developing skills are just two of the issues that Loh is looking to address in a new project called In Our Community. 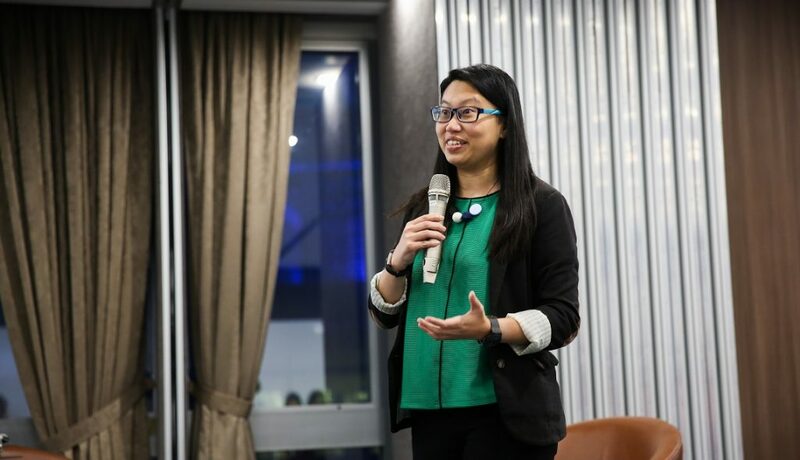 It will take shape as a series of monthly gatherings, bringing together policymakers, practitioners, researchers and end-users to “discuss and work on issues that we all care about”, Loh says. Over the course of the year, the series will discuss issues in three areas, she adds. This first is economy and financial services, which includes topics such as innovation, fintech, re-skilling and up-skilling, industry transformation and financial literacy. The second is health and wellness, which will look at rising healthcare costs, healthtech and chronic disease management, she says. Finally, there is community investment and how the private sector can provide more social support. The first session focused on the topic of skills development and was held on 11 January 2017. 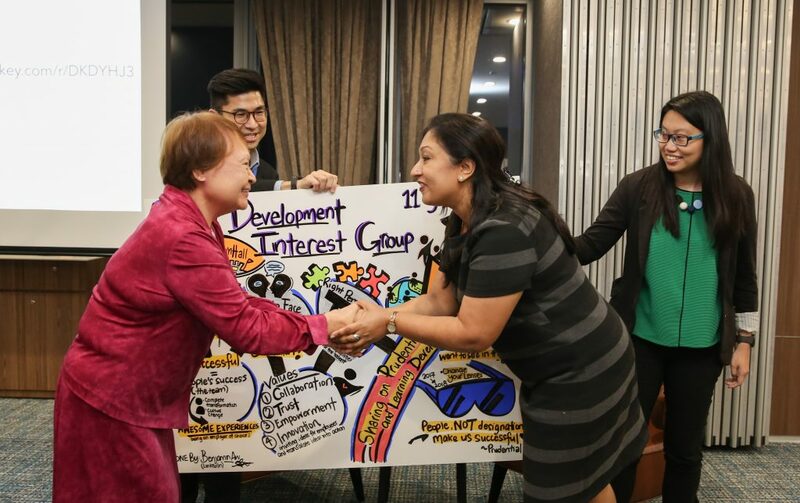 It saw enthusiastic participation from over 100 career development experts and officials from the Ministry of Education, Workforce Singapore, SkillsFuture, universities and polytechnics. Prudential hosted the event in partnership with the People and Career Development Association of Singapore. Dr Kevin Glavin from the University of Colorado, Denver, was the invited speaker and shared findings from his research on Career Construction Theory. Through a live demo, the audience learnt how the approach uses story-telling techniques to understand what motivates employees and how they choose their work. “As the world becomes a more complex and connected place, it is more important than ever for policymakers, industry practitioners, researchers and the end users to come together to hear from each other’s perspectives,” Loh says. She is now exploring areas of further collaboration with participants from the first event of the series. Prudential itself has gone through massive changes in 2017 to encourage employees to develop new skills. There is a particular emphasis on collaboration, which is how the new machine learning-based e-claims solution was made possible, Loh explains. “Today, in a matter of minutes, a claim can go through,” she says. “It couldn’t have happened if we didn’t have people working across teams: the IT team working with the claims team, for example,” she explains. The company has been on a “culture journey” to break down silos and remove traditional hierarchies. One obvious change in Prudential’s workplace is that no one – including the CEO – sits at designated desks. This “enables people to move around so there’s cross-pollination of ideas”, Loh adds. The transformation of industries – insurance and many others – will have a great impact on the future of skills and jobs in Singapore. With the In Our Community series, Prudential aims to bring stakeholders together to talk about and address these issues. The next ‘In Our Community’ event will discuss community healthcare.